The vertiginous decline in political leadership from Nelson Mandela to Jacob Zuma has engulfed South Africa in a serious crisis over the past ‘lost decade’. Based on his personal experience of the key protagonists, former British ambassador to South Africa Lord Renwick introduces the reader to an astonishing array of rogues and villains, ministers taken captive, crimebusters who are criminals, investigators who don’t investigate, prosecutors who don’t prosecute, red berets, black hearts and compulsive liars, alongside some heroes and an authentic heroine. 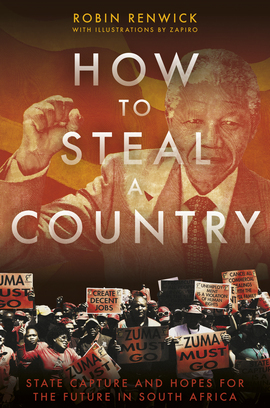 The book reads like a crime novel as Renwick explores the ingenuity, audacity and impunity with which the South African state has been looted on an unimaginable scale, and how Bell Pottinger, KPMG, McKinsey and others became complicit in this process. But, in the end, this is an uplifting story, as a remarkable press, judiciary and civil society combined to ‘save South Africa’ and its constitution under serious threat. Now, as Cyril Ramaphosa takes the reins, How to Steal a Country looks ahead to a brighter future, though Ramaphosa will find that his greatest challenges are within his own party.